Current affairs quiz provided in this article will be of a great help for the upcoming IAS Prelims Exam 2017. In IAS Exam preparation, the current affairs section should be exclusively prepared as it is considered as the most important in terms of a number of questions asked in the IAS Exam. 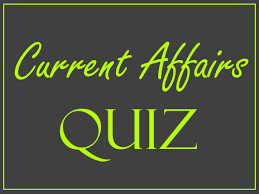 Hence, we are continuously providing the current Affair quiz based on the latest social, political and economic developments that happening in the country and around the world. I. Taking into account the long gestation period by Startups to establish, an entity shall be considered as a Startup up to seven years from the date of its incorporation/ registration (from earlier 5 years). II. No letter of recommendation from an incubator/industry association shall be required for either recognition or tax benefits. III. The scope of the definition has been broadened to include the scalability of the business model with potential for employment generation or wealth creation. • Age of Startup increased: Taking into account the long gestation period by Startups to establish, an entity shall be considered as a Startup up to seven years from the date of its incorporation/ registration (from earlier 5 years). However, in the case of Startups in the Biotechnology sector, the period shall be up to ten years from the date of incorporation/ registration. • Potential of Job and Wealth Creation: The scope of the definition has been broadened to include the scalability of the business model with potential for employment generation or wealth creation. As a constant endeavour to facilitate the Startup ecosystem, the Department of Industrial Policy and Promotion (DIPP) has been holding extensive consultations with stakeholders. The above changes are an effort to ensure ease of starting up new businesses to promote the Startup ecosystem and build a nation of job creators instead of job seekers. I. The MoU would facilitate bilateral cooperation in the field of organ and tissue procurement and transplantation and better understanding between the two countries. II. The knowledge gained will help in improving the services rendered to the patients suffering from end-stage organ failure. The Union Cabinet has approved the signing of a Memorandum of Understanding (MoU) between the National Transplant Organization, Ministry of Health, Social Services and Equality, Spain and the Directorate General of Health Services, Ministry of Health and Family Welfare, India on cooperation in the field of Organ Transplant Services. The MoU would facilitate bilateral cooperation in the field of organ and tissue procurement and transplantation and better understanding between the two countries. The knowledge gained will help in improving the services rendered to the patients suffering from end-stage organ failure. The Memorandum of Understanding is proposed to be signed during the forthcoming bilateral meeting with the Spanish side. FRP of sugarcane has been determined on the basis of recommendations of the Commission for Agricultural Costs and Prices (CACP) and after consultation with State Governments and other stakeholders. Recommended FRP has been arrived at by taking into account various factors such as the cost of production, overall demand-supply situation, domestic and international prices, inter-crop price parity, terms of trade prices of primary by-products, and likely impact of FRP on the general price level and resource use efficiency. 3. Recently, the news of Anshu Jamsenpa scripting history by becoming the first woman to scale the Mount Everest twice within five days. Who among the following first Indian women to conquer seven Summits of the world? Bachendri Pal is the first Indian woman to climb the Mt. Everest in 1984. With Anshu Jamsenpa scripting history by becoming the first woman to scale the Mount Everest twice within five days, we take a look at other women climbers who have achieved great feats in the field. Arunima Sinha, 26, became India’s first woman to conquer Mt. Everest on a prosthetic leg. A former national volleyball player, Arunima lost her left leg, having been thrown off a moving train for resisting a chain-snatching attempt by some criminals on April 12, 2011. Ace woman mountaineer Premlata Agrawal is the first Indian woman mountaineer to scale the seven continental peaks after climbing Alaska’s McKinley Peak. She is also the first Indian woman mountaineer to step on the highest peak of North America. 4. The FRP so approved shall be applicable for purchase of sugarcane from the farmers in the sugar season 2017-18 by the sugar mills. The sugar industry is an important agro-based industry that impacts the livelihood of about 50 million sugarcane farmers and around 5 lakh workers directly employed in sugar mills, apart from those employed in various ancillary activities including farm labour and transporters. This decision has been taken to provide appropriate price to the farmers for their cane. FRP of sugarcane has been determined on the basis of recommendations of the Commission for Agricultural Costs and Prices (CACP) and after consultation with State Governments and other stakeholders. Recommended FRP has been arrived at by taking into account various factors such as the cost of production, overall demand-supply situation, domestic and international prices, inter-crop price parity, terms of trade prices of primary by-products, and likely impact of FRP on the general price level and resource use efficiency. I. The Atal Pension Yojana became operational from 1st June 2015 and is available to all the citizens of India in the age group of 18-40 years. II. Under the scheme, a subscriber would receive a minimum guaranteed pension of Rs.1000 to Rs. 5000 per month, depending upon his contribution, from the age of 60 years. III. The same pension would be paid to the spouse of the subscriber and on the demise of both the subscriber and the spouse, the accumulated pension wealth is returned to the nominee. The subscriber base under the Atal Pension Yojana (APY) has reached about 53 Lakhs. At present 235 Banks and Department of Post are involved with the implementation of the scheme. Besides the branches of the banks and CBS-enabled offices of India Post, quite a few banks are sourcing subscribers through their internet banking portals in a paperless environment. The Atal Pension Yojana became operational from 1st June, 2015 and is available to all the citizens of India in the age group of 18-40 years. Under the scheme, a subscriber would receive a minimum guaranteed pension of Rs.1000 to Rs. 5000 per month, depending upon his contribution, from the age of 60 years. The same pension would be paid to the spouse of the subscriber and on the demise of both the subscriber and the spouse, the accumulated pension wealth is returned to the nominee.